Demonstrators in Mexico have attacked the Guerrero state congress in new protests against the government's handling of the disappearance of 43 students in September. 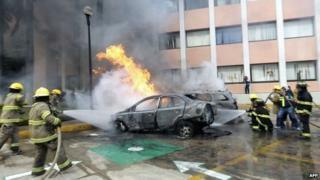 Five vehicles were set alight outside the building in the state capital, Chilpancingo. The students disappeared in the nearby town of Iguala more than six weeks ago. Mexican officials say local gang members have confessed to killing the students and burning their bodies. But remains found nearby have not yet been identified as the missing students. The students' disappearance has led to weeks of violent protests across the country. Wednesday's attack caused extensive damage to the Guerrero state congress building. It came after protesters torched the education department's audit office in Chilpancingo during a demonstration called by the teachers' union. On Tuesday demonstrators attacked the regional headquarters of the ruling party (PRI) also in Chilpancingo. The disappearance of the 43 trainee teachers and the links it has revealed between the local authorities and a gang calling itself Guerreros Unidos (United Warriors) have triggered mass protests. Investigators said that municipal police officers confessed to seizing the students, who had been protesting in Iguala on 26 September, and later handing them over to the gang. Iguala Mayor Jose Luis Abarca is under arrest on suspicion of ordering police to intercept the students. Iguala's police chief is still on the run. But residents say they suspect links between the gang and officials reach higher levels than that of the local town council. Relatives of the missing are also angry about the way the search for the students has been conducted. Tests carried out by the Guerrero state authorities suggested the bodies they contained were not those of the students. But Mexico's Attorney-General Jesus Murillo Karam later said the initial tests may have been flawed. On 28 October, experts searching the landfill site near the town of Cocula where gang members allegedly killed and burned the students found rubbish bags with human remains. The charred remains have now been sent to a specialised laboratory in Innsbruck, Austria, for testing. Results are not expected for several weeks.